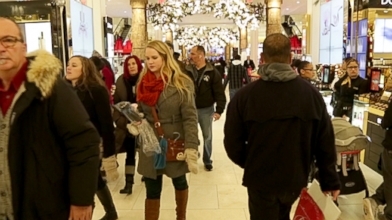 Linzie Janis looks for the best places to find great bargains just before the holidays. I have a story that ron will relate to. We're entering prime time for procrastination. There's a big sense of fear and determination at the mall. Linzie janis has been mingling with last-minute shoppers and has more. Can you help ron? Are you done with your christmas shopping? I was done a while ago. What a braggart. Reporter: Goody two-shoes, isn't he? I may not be telling the truth. Exactly. 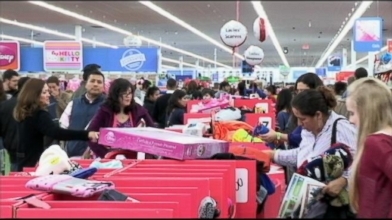 Reporter: Today is the second-biggest day for christmas shopping after black friday. And attention all your last-minute shoppers. There's plenty of deals to be had. With only four days left until christmas, plus a bout of freezing weather, shoppers are scrambling. Luckily for present procrastinators, so are retailers, desperate to shift all of that inventory. Shoppers can see two things this weekend. One, a lot of discounts. And two, a lot of different perks available online. Reporter: Where should we look for the best deals. We asked the experts. Their number one tip, go for the items retailers want to get rid of most. Like anything cold weather-related. Sweaters, hats, coats. A late start to the cold led to a surplus. Mens wear. Shirts, ties. Buyers were left uninspired. And toys, they're a bit like food. After christmas, they will be past their sell-by dates. Speaking of toys, toys "r" us, one of the many retailers catering to last-minute shoppers. The toy chain will be opened for 87 uninterrupted hours, starting today through 10:00 p.M. On christmas eve. And sofa shoppers, bloomingdale's and macy's, two of the stores that will ship your gifts free by christmas, as long as you order by the end of today. Lucky for me the stores are open late. I've been procrastinating and i need to get my friends at "gma" some gifts. &#9834; for our dan, it kind of says ron to me. Thinking of bianna. Damon. Sara's new office. All done. And with plenty of time to spare. Here we go. Thanks very much. Thank you. A lot of stuff for 100 bucks. Not only did I get all my gifts for under 100 bucks, I did it in a half hour. You have skills. Open them. That's mine. That's yours. I got one for myself. I love that you got two things for my office. A smelly thing. And a picture frame. Oh, whoa. This is so nice. Thank you. Bianna wants a cosmo, we can each have one. Anybody who knows ron -- what did you get? Dan, what did you get? I got cat bookends. Why did you get cat bookends? Because you're a danimal. It's a jewelry box. These are for our producers, john and tracy. Latte for john. The week before Christmas is among the busiest of the year, and here are tips to save on your last-minute gifts. Act 3: Mark Ellwood, author of "Bargain Fever," reveals his five tips for getting cheaper prices. 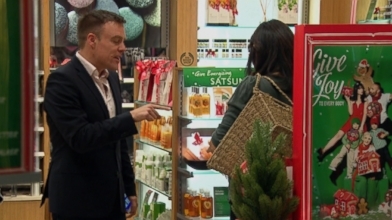 Stores are taking sales to another level in the final stretch before the holidays.